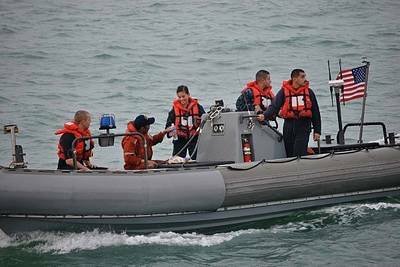 Boat crew from the Arleigh Burke-class guided-missile destroyer 'USS Spruance' (DDG 111) have rescued a Filipino mariner who fell overboard from a vessel in transit through the Singapore Strait. The Malaysian-flagged motor vessel Pantagruel made a 'man overboard' distress call and the Spruance picked the man up with its rigid-hull-inflatable boat soon afterwards. He was assessed by the crew as being in stable condition and was then transferred to a Singapore Police Coast Guard vessel. "The boat crew did an excellent job reacting to a stressful situation," said Lt. j.g. Katherine Miyamasu, Spruance's boat officer. " 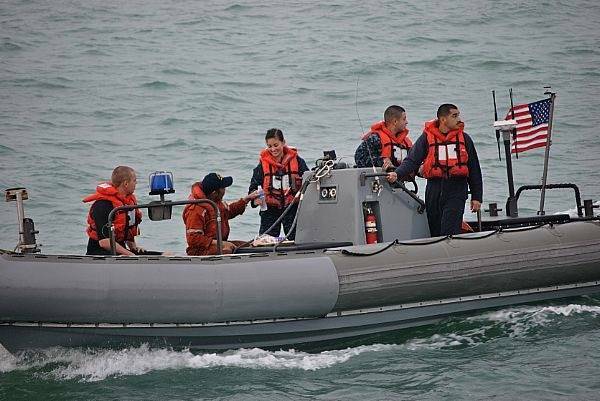 [Boatswain's Mate First Class] Jesus Hernandez spotted the man from the RHIB and everyone else sprang into action. It was a great day to be in the Navy."